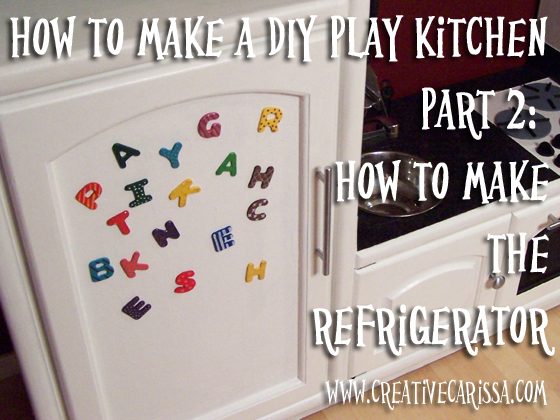 So sorry for the delay in posting part two of the walk through on how to make your own play kitchen. Big, exciting projects got in the way. 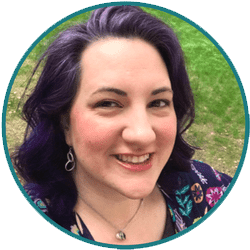 Big, exciting, I might get to be on TV kinds of projects! (But I think that's all I can share for now). All that to say... it just gave you more time to catch up right? Everyone got their entertainment center picked out, primed and painted? Good! Let's get cracking on the details! If you're following along with me and left off after the last post, you should have an entertainment center that is primed and painted but missing all of it's hardware. 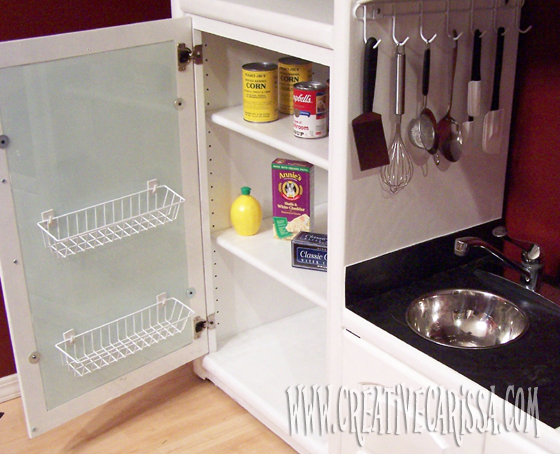 Before you move on to getting the fridge up and running, if yours has a glass door like mine did, you going to need to put primer on only one side of the glass and then re-install it in the door, primer side out. Go ahead and put the hinges back in and re-install the door as well, regardless of what it's made from. Every great fridge is magnetic so that's how we are going to make it! Go ahead and tape off the area you want to make magnetic. 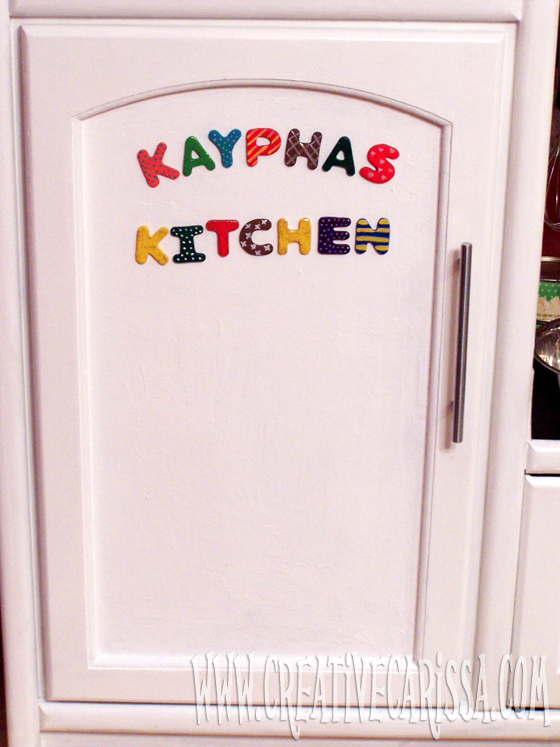 My fridge door had a recessed area and I decided to just paint that part with the magnetic paint. 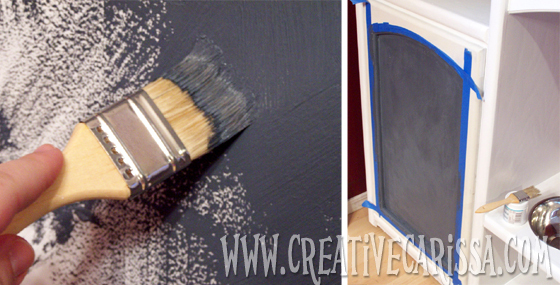 Using the brush you don't mind throwing away, paint your first coat on the door. Warning: This stuff is thick and you'll probably see your brush strokes. 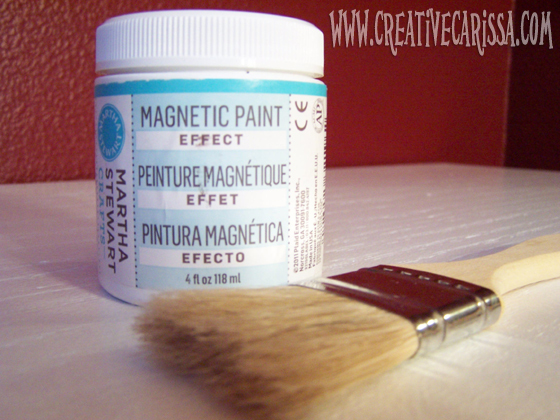 Once the first coat of magnetic paint is dry, you'll want to apply a second coat. This is where that small paint scraper comes in. 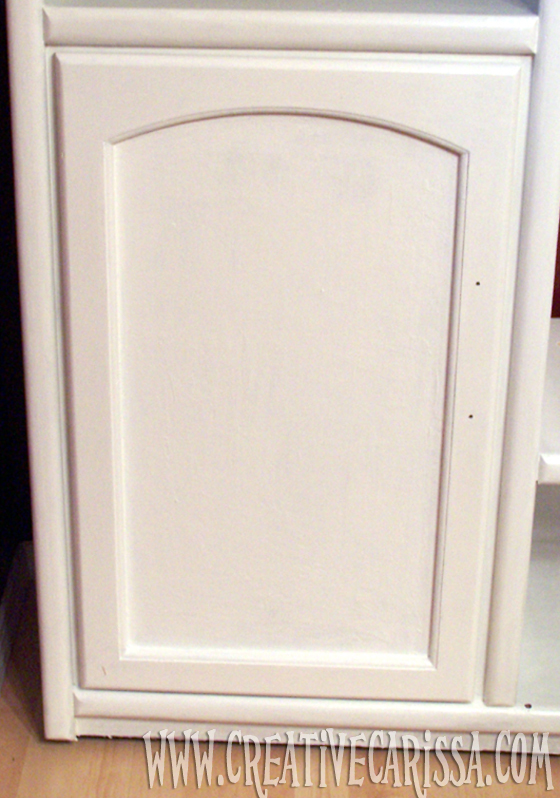 To help smooth out the ridges from the brush strokes, I applied the second coat with a scraper (think like you're spackling the door...but with magnetic paint instead of spackle).Peel off the masking tape while the paint is still wet. Once the second coat of magnetic paint is dry, paint your fridge in whatever color you'd like it to end up. I chose white, but you could do a "stainless steel" look, too. Get out your drill and install the new handle. My new handle used two screws (instead of just the one that the center came with) so I re-used the first hole and only needed to drill one hole. Now we need to hang the baskets we're going to use inside the door. 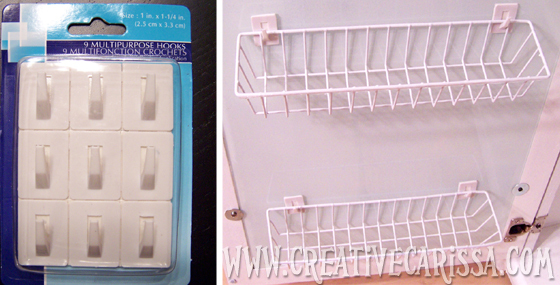 I got a package of 9 adhesive hooks and two wire baskets from the Dollar Tree. Make sure you follow the instructions on the package for the hooks for cure time to make the bond as strong as possible. That's it for the main part of the fridge! Now, of course you can accessorize. On the outside, I used the Alphabet Magnets I made when I wrote this tutorial. On the inside, I started to put empty food packaging like Annie's Mac and Cheese or cracker boxes since I don't have any normal play food made quite yet. 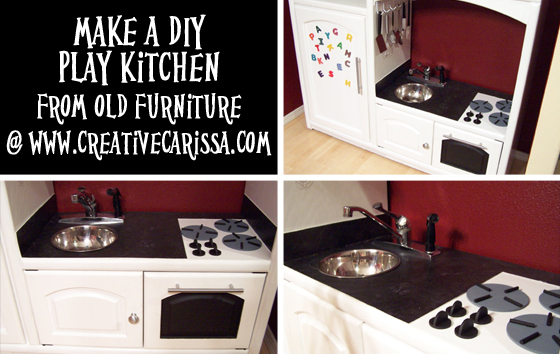 Join us next time for how to install a countertop, sink and stove! I'm picking up my free entertainment center that I found on Craigslist tomorrow. Can't wait to start this project!! The one I found has a glass door as well and I'm worried about the safety factor of using glass. Big (active) boys abound in this house and I keep envisioning a baseball/football/head going through the glass! Does the paint/primer you used make it less "breakable"? I could put a new door on, but that will add cost and work. Advice??? Thanks so much for your help! If you have big, active kids I would swap out the glass and replace it with a piece of wood instead. Got it. Thanks so much again. I'm so glad I found this.